If your skin is dry and rough most of the time, it means the air element of Vata is predominant in your skin. Vata skin tends to be dry especially during the autumn and winter months, and even during the summertime. The pores are a little larger, the skin is delicate, often with roughness. Vata people easily have dry-cracked soles of the feet. Air predominant vata skin is particularly sensitive to cold and windy weather. How can you look after your skin so it is emollient and beautiful? Here are some ayurvedic tips to help you! If your skin is dry and itchy, try to avoid dry foods, and eat foods that are a little oily and warm. Eat plenty of healthy fats like butter and olive oil. Ayurveda especially recommends ghee, which is clarified butter. You can use ghee for cooking, or add it to steamed vegetables for delicious flavour. Avoid foods that are too hot, spicy, cold or dry. Spices like black pepper are hot and dry, and turmeric is astringent, which means it has a drying effect. Eat regularly, and don’t skip or delay meals excessively. The three ayurvedic tastes that help balance Vata are sweet, sour and salty, so include more of these tastes in your daily diet. Have less of the bitter, pungent and astringent tastes. 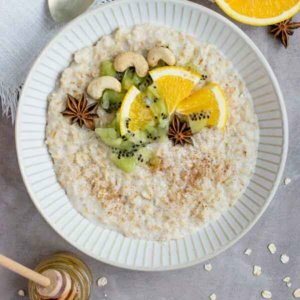 For breakfast, have oatmeal cooked with a little ghee or olive oil. Stewed apples and pears, cooked with a few cloves, are also delicious breakfast and snack items. Drink whole organic milk. Boil milk before you drink it to make it more digestible. Add 1/4 teaspoon ghee to warm milk for additional lubrication from within, and to ease constipation in the morning. Soaked and blanched almonds and soaked walnuts provide nourishment as well as lipid support. Almonds and walnuts can be cooked with milk, oatmeal, pudding or couscous. Carrots, asparagus, tender leafy greens, beets, sweet potatoes and courgettes are the best vegetable choices. They become more digestible when chopped and cooked with healthy fats. Vegetables can be combined with grains or mung beans for satisfying one-dish meals. Avoid nightshades and larger beans. For protein, eat legumes like urad dhal, mung dhal, masoor dhal, toor dhal, red lentils, all cooked until butter-soft. Brown Basmati rice is ideal for balancing Vata. Cook it with a little salt and ghee for added flavor. Wheat is also good, for example as fresh flatbreads (rotis) made with whole wheat flour. Cook with fennel; fennel is the best spice for this type of skin. Other ideal sweet spices are cardamom and cinnamon. Pureed soups, hot cereal, rice pudding and hot nourishing beverages such as nut milks or warm milk are excellent “comfort” foods and help balance Vata. Avoid or minimise raw foods such as salads and raw sprouts, especially in cold weather. Sweet juicy fruits of the season make excellent snacks. They are both cleansing and hydrating. Ideal fruits are pineapple, papaya, peaches, plums, grapes, mangoes, oranges, cherries, all kinds of berries, limes and lemons, apples if stewed, coconut, fresh figs, and soaked and cooked raisins. Avocados are great for their healthy fat content. Ideal spices, in small quantities, are ajwain, root ginger, asafetida (hing), fenugreek, turmeric, cumin, clove, cardamom, coriander, fennel, black pepper, basil, Chinese cinnamon, nutmeg, mustard seed, mint, rosemary, thyme, lemon and orange zest, oregano, rock salt or sea salt, black salt, dried mango powder, pomegranate seeds or powder. Drink lots of filtered warm water through the day. Rejuvenating herbs like Amalaki, protect and balance the skin for long-term health and a natural glow. Skin reflects your mental state, so mental stress tends to cause dry skin in Vata people. Vata-dominant people easily get mentally fatigued, and this can create ongoing mental stress, resulting in dull skin and dark circles under the eyes. A daily full-body massage with warmed sesame or relaxing massage oil can revitalize your skin. Don’t forget to massage the scalp with amala oil or bramhi oil to help reduce mental stress. Go to bed early to rest and recover from the day. Late night lifestyles aggravate vata. To avoid mental fatigue, take short breaks when performing tasks that require extended periods of intense mental focus. Walking for 20 minutes in the early morning in nature will clear your mind, and improve your circulation and skin. Deep breathing/ pranayama helps relax the mind and body, and builds up your energy. Laughter is powerful medicine for your skin and for your overall well-being as well. Vata skin is susceptible to cold and dry windy weather and dehydration is always a problem. Therefore, keeping the skin properly hydrated and lubricated is important for maintaining healthy, emollient skin. Protect as much of your skin as possible when you go out on cold windy days. Put light scarf across the lower part of your face and pull a cap down over forehead. Wear a protective coating of natural moisturizer on your face and hands and a lip creams to protect your lips. Drink extra water to support moisture balance from within. As your skin is delicate, avoid harsh chemical ingredients in commercial skin care products, which are likely to cause damage over time with constant exposure. Choose gentle natural products which support delicate skin. Need help for your dry skin? These diet and lifestyle tips will help your skin become healthier and more beautiful. However, if you have some underlying health issues, you may need the assistance of an ayurvedic practitioner. Dr Priya has many decades of experience helping people with skin problems. Call her today on (09) 829 2045 or email us for further info.